Thanks for your analyses, they made me like especially Yuyuko and Kanako even more than I already do. It's really interesting to see/read your interpretations. Musume can mean both daughter and girl. Anyways, Cirno's theme is pefect for her, IMO. It sounds like an adorable dumbass who sits around feezing fogs for amusement. Not elegant at all, but it's better that way. I don't feel that True Administrator represents Miko very well, but it is extremely fitting for the nature of the battle. The explosive fireworks and continuously flowing spell cards accentuate the repetitive pounding nature of the song, and the intense build ups and drops almost always fit with whatever is happening in the battle. I feel that Starry Sky fits Miko's character more personally. I'm not a musical analyst, but the entire song sounds contemplative and concise, thoughtful and manipulative, as if Miko knows exactly what makes people tick and how to exploit it- something that's backed up by her backstory and ability. on her ability blinds her to correctly judge some people. Am I the only person that thinks Youmu seems a bit mixed in the different games? There's the Mystic Temple disciplined Youmu, then there's the Hiroari stab-crazy Youmu. Also, Yukari's PCB theme makes it sound like she isn't even trying, but somehow that makes her better than you. The introduction is like she just gapped herself out of nowhere, and there are periods where it sounds like she's just lazing about. I think it fits the battle more than the character. Big thanks to iK for the avatar!! True, but maybe it's a mixture of character and battle mood. "Touhou" is japanese for "silly hats only"
Eagerly waiting for the end of Ten Desires analysis. 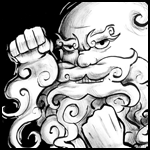 The introduction of Legend of the Great Gods is pretty much unlike anything I ever heard from ZUN before and I really don't know what to think about that one. It surprised me the first time I heard it and still sounds very strange whenever I reach Futo. Regarding Futatsuiwa from Sado, what I find immediately apparent is how danceable and fun (in a, say, Bluegrass sense) that theme is. When you get to the extra bosses, they are usually interested on terrorizing (Flandre), awing (Ran and Yukari), unsettling (Koishi or Nue) or saddening (Mokou) you. Suwako is obviously happy in her theme, but she's just a bit too frantic. Mamizou instead throws some kind of youkai hillbilly dance at you. What a culture shock. Whew, I finally went through all those pages (in two days). This is a good thread. I honestly didn't expect such an objective opinion piece. I really agree with you with Lunar Dial. And it's such a shame that it doesn't get real attention. Also, some of my observations and things you might want to know. 1. Wind and Aya do have a relationship as Aya's power is to manipulate wind. I am surprised no one mentioned this. 2. Colorful Path is probably the only window theme for Reimu that is not remix from PC-98, so the Gensokyo+ may only apply to this theme. And it's a really gentle piece. 3. In Lord Usa's Elemental Flag the time signature is 6/4, it's like a playful Tewi adding extra notes after each bar. And I think this is somehow similar to Cinderella Cage ~ Kagome-Kagome, except Cinderella Cage adds a bar after every 2 bars. (1:15) However this might just be a coincidence, as the folk song Kagome Kagome happens to be the same rhythm. Maybe ZUN just put in Kagome, then realized that the "extra bar" worked great as a happy rabbit's signature thing. 4. In Reincarnation, at exactly this timestamp, there are consecutive 4-note-melody-combos. I have noticed that the first set-of-four is more "broken", as the notes ends one instant before the normal time. Then when the melody continues, every time it repeats, the same "broken" effect appears. I am guessing being "just an evil spirit", becoming an important role in the series adds pressure to her. Complete Darkness is when she thinks this is the end of her appearances in the series so she wants to make it a great final effort. Yep, this makes perfect sense! 5. Am I the only one who likes True Administrator? If you say bad things about Miko she is going to perma-ban you. Joke aside, somehow the climax of the song always ends up near when Miko says "Enough playing around! ", where she unleash a really awesome-looking non-spell attack. I really like True Administrator for it's simplicity and power it throws at the listener. And just a small note, Miko is The Prince Shotokou, which all Japanese can recognize in 0.1 nanosecond, and all the spells are some kind of reference from their history textbook. All the players need is a really powerful BGM to allow them go all OMGOMGOMG-ish. Pardon me for my bad English. It's a hard language for a regular Hong Kong otaku student. Is it just me or does it sound rather Megaman-ish..? This was a good read, even though I skipped some pages it was interesting and enjoyable as a whole. Looking into the characters themselves using the feel of their themes is something I would like to see appear more in fanon. In case of alternative themes I would say that Reimu and Marisa would be interesting to look into, especially because of their stupidly large amount of themes. Not saying that anyone should, just that it's interesting how the two main characters can be that developed, if we can treat a characters theme like a small story. I think stage themes should be done too as it may represent the midboss. I am requesting "The Dark Blowhole" for starter! In HM, there are 2 pre-battle themes: A Popular Place and An Unpopular Place. The former has 4/4 time, while the latter 6/8 (2 over dotted quarter note) time. An Unpopular Place's time signature makes the song feel slightly drunken. Only a drunk person will stumble into such an unpopular place. The moment you realize no one cares. Personally, I think Border of Life (first arrange) carries triumphant and grace but also sadness. Maybe Yuyuko has realized the outcome of her battle but still fights on. Or she does have lingering sadness from her death. Truly an amazing character. You should always try your best. Or use my strategy and hug the bottom and pray not to die. Oh, so this trial of guts is for ME? Interesting analysis. After I've read your review of Reach for the Moon, Immortal Smoke, I could certainly see where you came from when you said that the busy, unrelenting melody representing that one thing that was fire. What I liked even more is what you mentioned Mokou's fire (and the symbolisms it may imply) to be not the kind that is quick, like a bomb shell, but an elder enveloping blaze - one experienced and ancient. 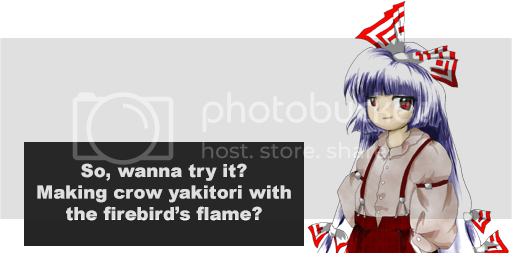 That is one aspect that I think many fans dismiss about Mokou. But after reading her chapter in Cage in a Lunatic Runagate, I think they may see she stems much more deeply than they thought. But one note I'd like to make is that instead of fire, I hear this melody portraying time. This quick paced, repeating melody representing time's unyielding march, with the hint of sadness as Mokou witnesses everything and everyone around her passing away as she stays and sees this world like some sort of twisted ride. But I also hear this search of identity Mokou was trying to find, as you put it in your analysis. I also believe Mokou to have forged herself her own personality, one that she can call "I" that isn't just a collection of her past memories and hatred. I believe that in this personality she forged herself a powerful and wise elite. Maybe even a sage of the forest she lives in? 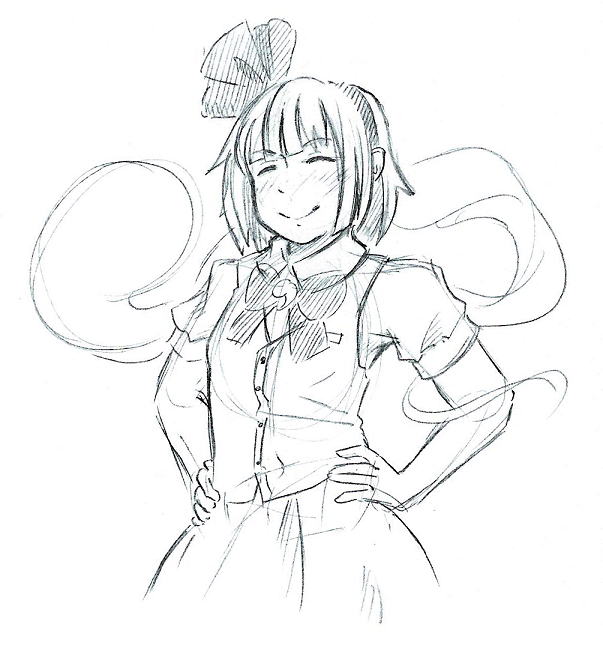 I could feel this charisma that she made for herself in the game itself, and tied with the music and danmaku, I think three spellcards in particular, "Xu Fu's Dimension", "Ihakasa's Moon Curse", and "Hallow Giant Woo", best represent that theme. Great analysis, you've given me new insights on many of the characters (in particular Yuyuko, Kanako, Tenshi, Kogasa and Byakuren). I'm not particularly avid of playing the games themselves, but your words sure make me understand better the way the characters appear, and their spell cards when played together with the music now. It's a shame you're not continuing with the remaining boss themes of Ten Desires, Hopeless Masquerade and Double Dealing Character, or touching any of the stage themes. I've really enjoyed many of them (especially the stage 5 themes that often come with individual midbosses). Yeah, it's pretty amazing how much of an impact music has on this game. The enemies are even (mostly) synced to the stage music. But what about the types of enemies, or even the patterns that are fired? Could that have something to do with the music, as well? Gender: Male, boring i know. Does anyone actually know what happen to Fightest, he(?) seemed to have just dropped from the face of the earth one day and never came back. Maybe we should send him a Pm ? I don't remember if he said he's specifically busy with something (I want to say university? ), but also, it's life, as viewed from the internet. These things happen. In other news, time to move on properly onto Mountain of Faith! As I mentioned before, I love the music here. It is also the last of "classic" ZUN before he goes all creative in SA and UFO. Unusual for a first boss theme, there is an immense amount of power emanating from the piece due to instrumentation, and its unrelenting tempo. Additionally, it has a touch of aloofness and, perhaps, cruelty, due to certain sound qualities, which I’ll get into later. The introduction’s strength comes from loud, separated piano chords, each accented by the strong beats of a time signature with many strong beats – 2/4 (C with a line down the middle for those who know what I’m talking about). The supporting acoustic guitar is an interesting touch, as the guitar is most commonly heard in Spanish and Latinoamerican dance music. The dance of these cultures (the Cha-Cha-Cha, the Tango etc.) is extremely harsh and precise, yet intimate and sensual. In fact, the introduction has a few unmistakable features from the Tango, giving me a previously unconsidered image of Minoriko – a graceful, proud and powerful dancer, a harsh mistress that rewards loyalty with a dedicated affection. Castanets are optional, but absolutely appropriate. That said, the single melodic part of the piece maintains the same rhythm as the introduction, swapping the piano for trumpet, keeping the guitar intact. To me, this is just the continuation of the dance that was started in the introduction. The biggest change is the switch from 2/4 to 4/4 time, allowing for fewer stronger beats to allow for a flowing melody, 8 bars long with a fair share of cadences and key transitions for a comparably short melody. These cadences demonstrate the emotion flowing off Minoriko - she is also of the type to show what she feels, when she feels it, very clearly. This show of emotion, however, is strongly embedded into that furious dance of hers, making it almost a part of her very self, making Minoriko as she is described here something indivisible, something elemental. I believe this is appropriate, considering the animistic nature of Shinto gods. More than just a goddess of autumn harvest, Minoriko is the goddess of reaping what you sow, of reward for loyalty and punishment for lack thereof, a goddess of clear consequences to deeds done. She is impartial in her judgment, and may seem cold and distant for this, especially so if one incurs her karmic wrath, but she is just as capable of blazing passion should one be in her favour. Truly, there's no middle ground to her. Ironic that you mention her as a dancer, considering her art shows her with two left feet. To be honest I have a few problems with that BPIiSM interpretation, but I did laugh at your joke (I found the two left feet thing funnier than I should've). That might've just been ZUN producing fantastic artwork as usual, although it does seems a bit too odd. That's something hard to screw up, so it might as well have been intentional. Touhou Wiki seems to think it's intentional, but only "supposed"ly. Also the person responsible for these analyses hasn't been active for quite a while so probably don't expect a response from them either. Anybody realize that Inner Heart sounds like Gangsta's Paradise? Eep. Here's to hoping Remi's just getting carried away. What hit me after the third or fourth playthrough of this track is that both melodies present in the piece, discounting the connecting segment at 0:26, are actually quite pleasant. I’m going to contest you here, Solais – the melodies, taken completely by themselves, feel really quite dance-like for the first one and extremely lyrical for the second. Although they carry a slightly bitter tone, they are certainly not threatening or mindscrewy. The mindscrew is completely carried by the accompaniment and instrumentation, and is ramped up by them to immense proportions. I’ll go over the content of the melodies first, as the most interesting parts lie indeed where the mindscrew is greatest. The first melody has many strong beats, lots of ornamentation and syncopation to emphasise those strong beats. As I said before, this smacks of a dance to me, a fast-paced, whirling dance with lots of emphasis on steps and jumps. Considering the harmonies present (and I hesitate to make the comparison due to poor familiarity), this reminds me of Middle-Eastern dance music. Whether intentional or not, these kinds of harmonies might sound alien to those unused to it, for example some of us Westerners, thus painting Satori in an unfamiliar light, something we can’t associate with. Of course, fear of the unknown is probably one of the more animalistic emotions humans (and, I guess, humanform Youkai) have, so it is probably little wonder why Satori is so feared, not even taking into account her power. Of course, this means that many won’t notice the grace with which Satori holds herself, her quiet and strong dancer’s confidence. This last bit is more of an afterthought, but the sort of dance that this melody bears similarities to is usually danced by men, so there could be a bit of masculinity in Satori, probably most prominent in her assertiveness in her introduction dialogue, where Satori demonstrates her dominance over the characters by holding a one-sided conversation with the characters by reading their every thought. The second melody is quite straightforward in its harmony, with few odd tones, instead going for a minor key with a few detours into major to show sadness, longing, a certain depression. 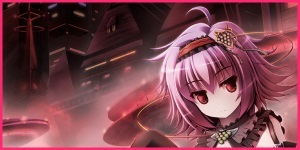 The Satori shown here is probably unhappy with her current situation, whether it is because of the way she’s seen by others or due to something more ephemeral. I would say it’s simply because she’s lonely, considering her only company for the last whoever-knows-how-long are not the sharpest tools in the shed. The accompaniment and instrumentation are what really give Satori her “oomph”. ZUN pulls out pretty much every trick in the book to make the listener uncomfortable and the sound disconcerting. The first melody starts off with a growling bass and the harshest acoustic guitar I’ve ever heard, cymbals, of course, providing sharp accents at the most opportune times. The first melody continues, and the guitar picks up, its completely cold sound having the potential to actually scare, since it really brings a lot of attention to itself, making it sound louder than it actually is. This is another of those animalistic things that seem to permeate Satori’s repertoire – loud, sharp, high-pitched sounds tend to quicken the pulse, pushing the listener into action. Of course, the listener has no way to actually respond other than to turn the track off, so the helplessness combines with the adrenaline rush to actually create the feeling of fear. Remember that famous track from Psycho? This is much the same effect. You’re absolutely right here, Solais – the fear is completely internal, created by the listener himself, with nothing to really inspire it other than some loud sounds. The second melody does much the same, except this time with a loud bass, the minor key of the melody giving it a threatening tone. Its unique contribution to the mindscrew comes in the second repetition, where the melody’s played by two trumpets in a diminished interval, one that sounds just off a pleasant regular interval, once again making the listener squirm, completely uncaring about it. Basically, Satori seems to be a master at freaking people the hell out, demonstrated by the variety of techniques the melody employs to do so. It’s clear that she does so consciously, so I feel she’s somewhat of a bully. She might lament this from time to time, and might even show regret, so there’s quite a bit of a complex going on within her, balancing the need to assert herself versus the want to have some more varied company. A large factor that pushes people away from her is their inability to understand her, so it’s probably simply a matter of time before others get more used to her, and she stops taking advantage of their weakness. Page created in 0.073 seconds with 40 queries.